The Intermec CV30 compact computer is as durable as a forklift. It is highly reliable and just as robust, thanks to its cast magnesium housing. The compact design simplifies mounting to any desired location - as a forklift terminal directly onto the vehicle or as a fixed mount for device management applications. Easily operate the computer via its integrated 6.4 LCD touch screen display and front-side function keys. In case of a defect simply replace the touch display on-site. This reduces downtimes to a minimum and saves on packaging and shipping for the repair. For the highest operational flexibility the CV30 comes standard with a heated display for extreme temperatures down to -30C. Thanks to an integrated Ethernet port and Wi-Fi module, the CV30 is entirely network-capable. You may even control devices wirelessly via Bluetooth. The robust cast magnesium housing will not quickly be harmed. It complies with IP66 standards for excellent protection against splash water and dust it is also optimally protected against vibration and impacts, according to MIL-STD-810G. Intermec CV30 Compact Keyboard - Compact Keyboard mounts directly tothe CV30. 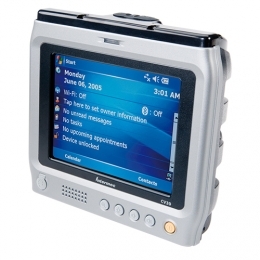 Requires VE011-2003 mounting bracket to mount to the CV30.To use additional USB accessory,VE011-2021 cable required.